A central concept within How to Speak so People Listen is the need to make your speaking ï¿½compelling, persuasive and powerfulï¿½. 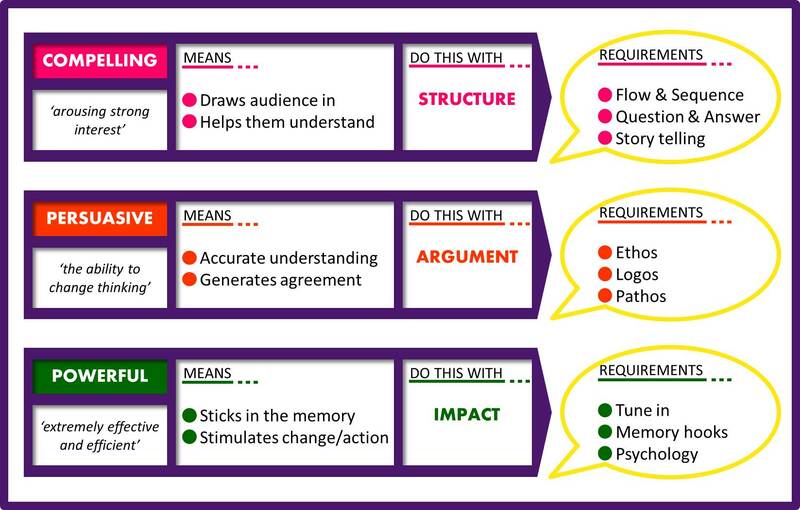 ï¿½This simple poster summarises what those three concepts mean. You can also download a pdf copy of this Compelling, Persuasive and Powerful poster. Get it and master your speech..."
"I am particularly impressed with 3 key things about the book. First, the simple message resonates with the simplicity and directness of the book's title and it encapsulates a very basic human need - to be listened to. Second, I find the layout to be particularly easy and memorable especially with the use of the visuals and 3rd the bite size actionable insights/tips makes this book my favourite 'go to' reference material." "Very well written. Engaging. Great practical tips that are easy to use in any situation. I would highly recommend it." How to Speak so People Listen is filled with valuable resources; in particular, there are over 20 Speaker’s Checklists. I have also made a series of videos to accompany the book. You can see my One Minute How to Speak so People Listen Tips here. For a summary of some of the key ideas, take a look at the How to Speak so People Listen infographic on the next tab. See Creativity Works’ marvelous video “Busting the Mehrabian Myth” below. I email out free newsletter tip-sheets about 16 times a year. Click here to subscribe to my Thoughtscape newsletter. Take a look at the archive of previous newsletters, including many on the theme of speaking so people listen.